Relax. 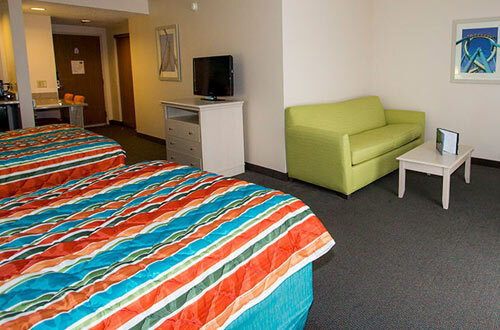 Castaway Bay Offers Comfortable Rooms and Suites of All Sizes. 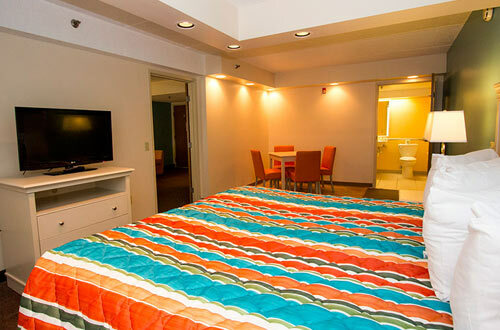 Dolphin Rooms are ADA Accessible rooms, featuring a Queen Bed and a Sleeper Sofa. Your room reservation includes 3 Waterpark passes. Pelican Rooms feature 2 Queen Beds with a balcony. Your room reservation includes 4 Waterpark passes. Starfish Rooms include 2 Double Beds and a Pull-Out Chair. Your reservation includes 4 Waterpark Passes. 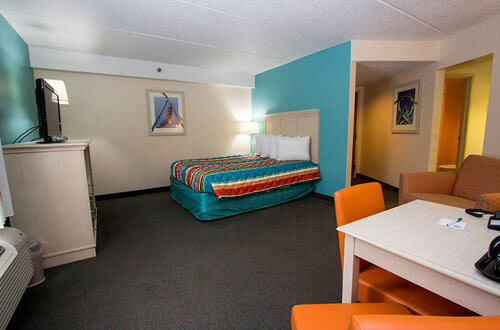 Angelfish rooms offer feature a Wet Bar and balcony along with 2 Queen Beds and a Queen-size Sleeper Sofa. 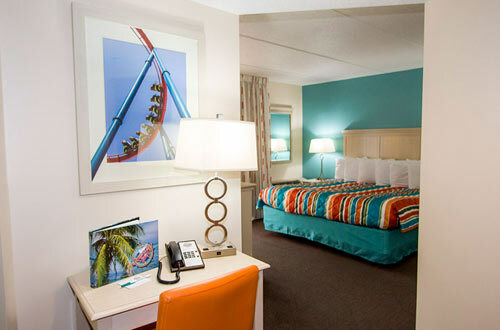 Your room reservation includes 4 Waterpark passes. 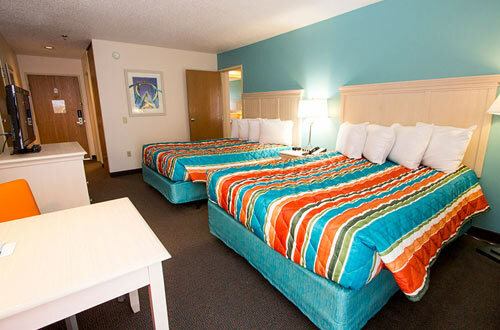 Tarpon Suites are 2-room suites with a King Bed and a Semi-Private Bunk Bedroom and balcony. 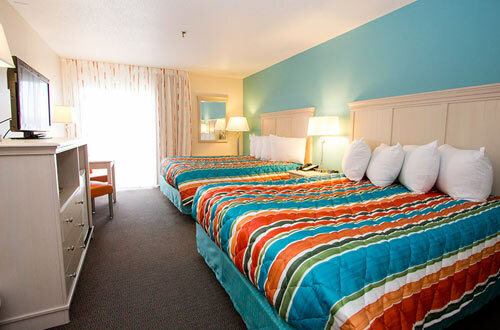 Your room reservation includes 6 Waterpark passes. Parrot Suites are spacious 2-Room suites with a Queen Bed and 2 Double Beds. These rooms do not include a balcony. Your reservation include 6 Waterpark passes. 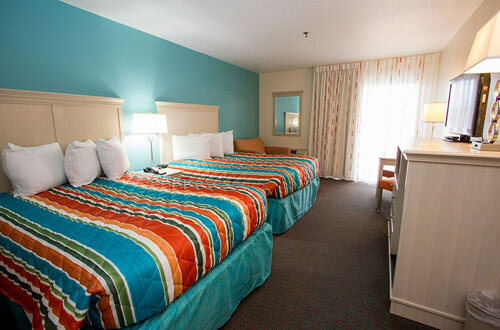 Seahorse Suites are 2-Room ADA Accessible suites with a King Bed and 2 Queen Beds. These suites also feature a wet bar and balcony. Your reservation includes 6 Waterpark Passes. 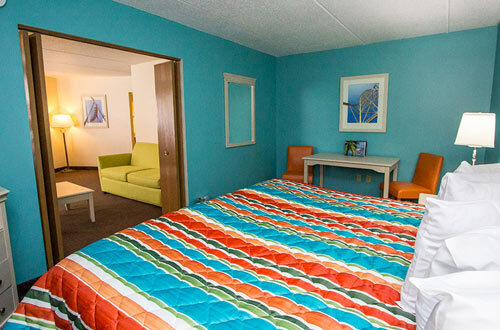 Manatee Suites are 2-Room suites with a King Bed and 2 Queen Beds. These suites also feature a wet bar and balcony. Your reservation includes 6 Waterpark passes. 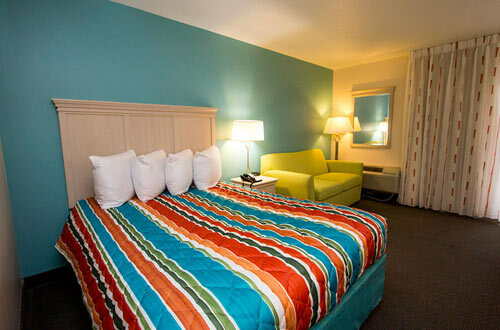 Flamingo Suites are incredibly spacious 3-Room suites with a King Bed, a Queen Sleeper Sofa and 2 Double Beds. These rooms do not have a balcony. Your reservation includes 6 Waterpark passes.